The official blog of SimplyTapp, the inventors of Host Card Emulation (HCE) technology, empowering issuers and developers to leverage mobile devices for proximity payments. Visit SimplyTapp.com to learn more. This is the key concept and change between EMV and what is required for CBP cryptograms. Effectively the cryptogram in the CBP payment is created half in the cloud and then the other half when you tap the phone. The reason for this is because the network connectivity may not allow a scenario like the left side of the diagram below as the UN would get cut off from transmitting from the POS to the calculation space, or it would be subject to network latency and create a "Tap and Hover" effect that would be an awful user experience. 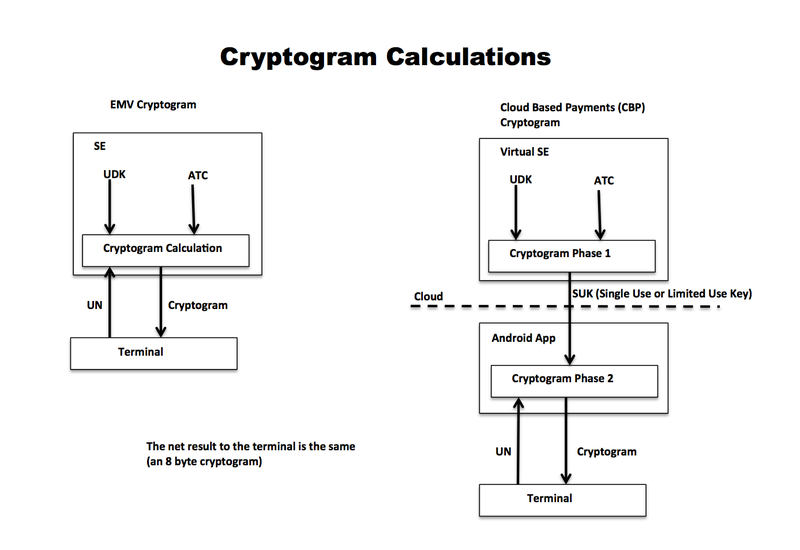 The CBP cryptogram allows all components to be used as before and exposes a "relay threat" only to the android app after the SUK is received, but not to the POS terminal. It also allows the Phase 2 calculation to happen independent of cloud availability at tap time. The Phase 1 calculation and delivery to the phone from the cloud is expected to be preformed prior to tapping the phone, but not during the tap itself. The thought is to offset the relay threat with in app security and sensor rich android OS. It becomes a net neutral from a security standpoint really, IMO. CIITN is located in Prime location in Noida having best connectivity via all modes of public transport. CIITN offer both weekend and weekdays courses to facilitate Hadoop aspirants. Among all Hadoop Training Institute in Noida , CIITN's Big Data and Hadoop Certification course is designed to prepare you to match all required knowledge for real time job assignment in the Big Data world with top level companies. CIITN puts more focus in project based training and facilitated with Hadoop 2.7 with Cloud Lab—a cloud-based Hadoop environment lab setup for hands-on experience. CIITNOIDA is the good choice for Big Data Hadoop Training in NOIDA in the final year. I have also completed my summer training from here. It provides high quality Hadoop training with Live projects. The best thing about CIITNOIDA is its experienced trainers and updated course content. They even provide you placement guidance and have their own development cell. You can attend their free demo class and then decide. Aw, this was a really nice post. In idea I would like to put in writing like this additionally? Taking time and actual effort to make a very good article? But what can I say? I procrastinate a lot and by no means seem to get something done.